Glen Bear has still not materialized anywhere at LBHQ. Last night Blackie and I had a good cry about it while Fluffy observed us emotionlessly and Scarybear attacked a plate of ginger cookies, which he would have done anyway. This should not be a sorrowful time of year. This is Glen’s favorite time of year, when his big, thick coat of white fur is his best asset and he doesn’t mind cuddling. But he’s gone. He seems to be…really gone. It didn’t seem respectful to drown our sorrows last night, but what the hell else was there to do? Blackie Bear isn’t an alcoholic, and he has some common decency, so he hesitated—but not after we’d got the CANADIAN CREAM open. The lid wasn’t even tightly on, my fellow inebriates, it was a cinch. This means my mum was into it last. With her habit of returning jars and bottles to the fridge and cupboards with the lids barely on, my dad won’t even pick up a jar or bottle by the neck any more; it’s too dangerous. He retaliates by closing jars and bottles so tightly that she in turn can’t get them open without asking him nicely. This is the state of their marriage. It’s also how I know who’s been into what most recently. And my mum has apparently had some of my liqueur, otherwise Blackie and I wouldn’t be able to pour a toast to Glen. Ahhhh, I know you’ve been wondering how our CANADIAN CREAM turned out. Or maybe not, in which case, here’s a picture of some people shopping at Walmart. When we first made the CANADIAN CREAM it seemed a little thin. 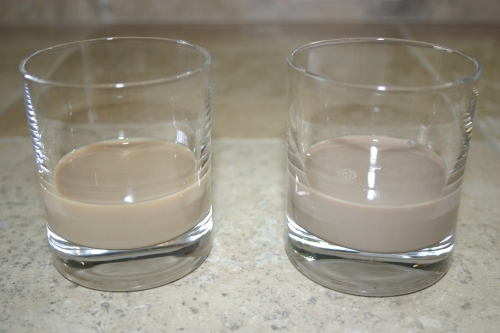 Then again, we couldn’t remember the exact consistency of Bailey’s. (And no one would buy any, even to be scientific.) Over the last 17 days our concoction has thickened noticeably, achieving what seems to be the right viscosity. How does it smell? The aroma is comfortingly familiar—definitely in the neighborhood of Bailey’s if not right next door. The top note is milk chocolate, a full cup of which went into our recipe. Next time we should probably reduce this a little. Under the chocolate is the scent of delicious whisky, mellowed somewhat by a fortnight in a plastic milk jug. Of course it hasn’t really aged; whisky ages in casks, after which it ceases to mature. If it were to take on the characteristics of a two-litre plastic jug…well, we wouldn’t really want that. But somehow our three cups of Wisers have married nicely with the milk ingredients; the mixture doesn’t have the same searing booziness it had when we first poured it into the jug. Which is to say, it’s become less appealing. The container needs a vigorous shake. Some of the chocolate has settled down to the bottom—not in chunks or particles, mind you, just a layer of darker chocolatiness that reluctantly goes back into solution if you jump up and down with the jug for a while. CANADIAN CREAM coats the ice cubes in a crystal rock glass, looking eerily like Bailey’s but naggingly not. It is thick and creamy, but not as smooth as it should be. It foams a little over the ice instead of settling into a smooth, placid surface. The consistency feels right. But there is something missing in the taste. And something added. ???? We can’t figure it out. Almond? Vanilla? Coffee? Booze. It needs a smidge more. Definitely chocolate. It’s not oppressive, but the additional chocolate makes our version seem a little sophomoric—like a milkshake but less thick. Something higher-frequency…not sourness, this stuff had better not be souring this soon. But something about the homemade stuff is not quite as…deep. The upshot? A sense of dissatisfaction. A longing for the exact right thing and a sense of discomposure at not quite having it. Kind of like if someone suddenly produced a polar bear who looked just like Glen but was really just one of his Animal Alley™ twins. Not our Glen with the stained paw. Not our Glen whose fur Miss P decided to trim one day. Not our Glen who warms me up with a winter cuddle. Oh, I’m sorry. That first picture of Glen and Miss P as a baby got me so emotional that I could barely finish reading the rest. Glen almost won that round. But he was just a baby too and he didn’t have claws yet.